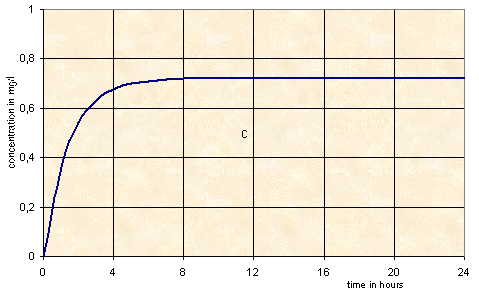 Plasma concentration-time curve during the infusion of a drug at constant rate. Plasma concentration increases until the quantity of drug arriving in the compartment per unit of time is equal to the quantity eliminated. This equilibrium corresponds to the steady state, Css, which is attained in 5 T1/2.